A constitutional amendment would make sure that crime victims are heard in the justice process. As Maine’s first lady, I have had the honor of meeting the people of our great state under many circumstances. From celebrations to the most serious of occasions, the one thing that always strikes me is how resilient and full of spirit each one of us is. Mainers are known for rising to every occasion during the most challenging of times, whether it is disruptive weather or community needs. This is especially true when a friend or loved one is victim of a crime. When an individual suffers a crime, the impact echoes among those closest to them and the larger communities around them. Depending on the severity of the crime, the ripple effects can be tremendous, and it can take years for victims to heal, if they ever do. My own family has experienced what it is like to be victims of a serious crime. Many people don’t know this because we don’t talk about it often, but our lives were changed forever in one moment because of someone else’s actions. Our perception of safety will never be the same and our hearts will never fully heal. But when crime struck our family, we came together, worked our way through the criminal justice system and got on the best we could. For some victims and their families, it’s not that simple. That is why I support a bill called Marsy’s Law for Maine, part of a nationwide effort spurred by a California mother’s chance encounter with the suspect in the 1983 murder of her daughter, Marsalee “Marsy” Nicholas, while the man was free on bail. Marsy’s Law for Maine is a proposed constitutional amendment that will help protect all Maine citizens by making sure victims of crime in our state have guaranteed, enforceable rights and protections that are equal to the rights of people accused or convicted of crimes. With this bill, crime victims will have the right to timely notice of hearings and proceedings regarding their case and the right to be present at proceedings and hearings where the accused will be present. Crime victims will also have the right to be notified if the offender in their case is released from jail, the right to restitution and the right to be heard by prosecutors before decisions in their case are made. Of course, Marsy’s Law for Maine allows all Maine crime victims to waive these rights. But it puts power back in victims’ hands. They get to choose. Some will say that statutory rights for crime victims are adequate. I disagree. Current laws protecting crime victims can be changed with a simple legislative majority. This means all current laws protecting crime victims could change while criminals’ rights are constitutionally protected. I believe it is only fair that crime victims have guaranteed rights they can count on. Marsy’s Law for Maine will do that, and will give crime victims some sense of justice in an extremely difficult time for them. It also will bring Maine into the fold with the majority of states that already afford constitutional rights to crime victims. Maine crime victims deserve more than statutory rights. 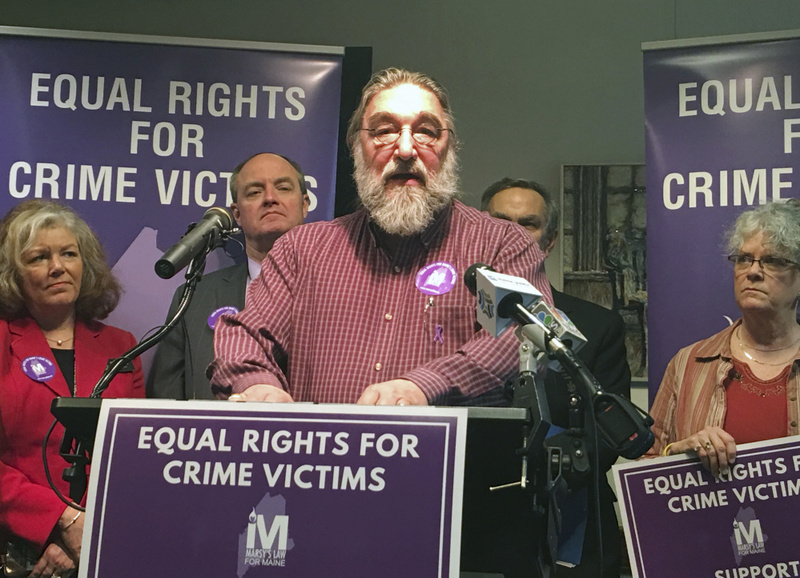 They deserve the common-sense equal rights, protections and legal standing that Marsy’s Law for Maine will afford them, and they deserve a voice in the criminal justice system. I am proud to say that Marsy’s Law for Maine supporters include community leaders, law enforcement leaders, faith leaders and crime victims and their advocates, all of whom are working together to pass this important bill. I am equally proud this is a bipartisan effort. With the approval of Maine lawmakers in the coming months, Marsy’s Law for Maine will be on the ballot on Election Day next November for voters to decide. I have never before spoken out and shared my opinion on any matter being considered by the Maine Legislature. I don’t often see that as a role the first lady should play. But this issue is too important for me to remain silent. All Mainers deserve to feel safe and protected. God forbid they find themselves in a situation they could have never anticipated. I hope you will join me and the thousands of Mainers who support the equal rights that Marsy’s Law for Maine will afford crime victims. God bless our great state. May you all have a warm and safe holiday season. Ann LePage is first lady of the state of Maine and state chairwoman of Marsy’s Law for Maine.